Are you looking for fun Halloween masks? Masketeers.com has the biggest, coolest collection of printable masks on the internet! Over 800 masks - all available for instant download too, so you can get mask making straight away. With everything from aardvarks and zebras, to aliens and zombies, there's more than enough action here to keep even the largest party or class of kids happy. 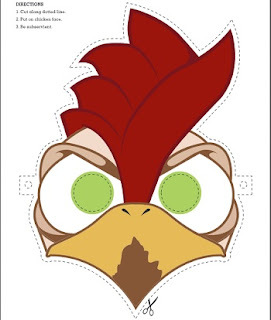 Want to be a crazy chicken for Halloween or play time?